Bun The Grid catapults into Fall with its second North American signing, Brooklyn’s Doctor Jeep. After several years exploring the West Coast festival halftime sound, Jeep returns to his love of Bristolian polyrhythmic club tools. “Vault of Glass” channels underwater atmospherics in a dark, broken- beat, warehouse style, while collaborator and tour partner Fixate joins the fray on “Dorado” - summoning disembodied voices and frantic breakbeats to hypnotize late-night ravers. Switching the energy with a modern DnB-meets-Dancehall vibe, “Emergency Broadcast Test” features Washington DC’s Cirrus. On the flip, two remixes add an uptempo flavour to “Vault of Glass”: hyper-active juke from London’s Hyroglifics, and a punishingly-heavy hip hop twist from Calgary-via-Detroit veteran Sinistarr. 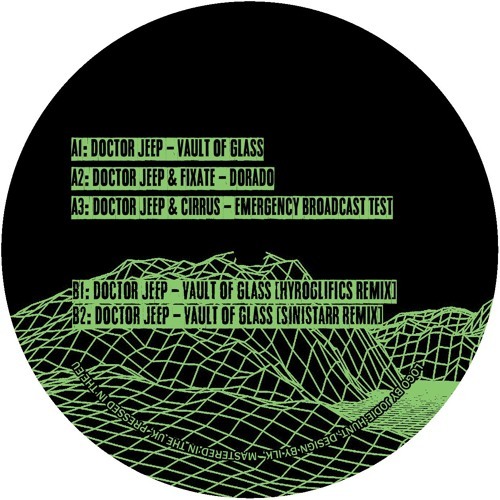 Support from J:Kenzo, Fracture, Roska, The Librarian, Solid Blake, Marco Zenker, Kate Miller, Rob Smith/ RSD, Koast, Sam Barker, Paul Frick, Murder He Wrote, Fink, Photonz, Walter Ego, Chrissy, Darwin, Desert Sound Colony, Truss (Overmono), Murlo, Amy Becker, 96 Back, ASOK, Second Storey & More.